Thank you for all the sweet comments about Alex and his Fez Frog. He has been enjoying those as much as I have... maybe more. I think Santa and I have worked something out, so if Alex continues to be a good boy, this should have a happy ending. Maybe he can illustrate one of his grinning frogs. He draws these frogs, and lots of other amazing things, freehand, from his own vast and wondrous imagination. We keep a lot of art supplies around here, and in the car and under the beds... coming and going... pencils, markers, charcoal, erasers, and paper of course! No wonder I've always admired those clever pencil roll carrying cases I've seen around. When "Lemon Tree Tales'" Tami made a color coordinated carrying case, I finally could not resist making one too. Mine is just a first try and made for washable markers. I love the color match one that Tami made and I may still try that, but I knew I had to practice first. She kindly offered to share the details of the pattern, but I am too impatient and intimidated by patterns. I think her post and encouragement were all I needed to give it a try. When I finally stole time to put this together I just sort of worked around the size and number markers I had on hand. I also tried something kid-friendly for the closure. I covered a button in coordinating fabric and attached it to the edge and then I sewed on a pony-tail holder a few inches from the button. I think a young child should be able to pull the band over the button and keep the markers secure in their new home. The pens slide in and out easily, but they do not fall out... so cool! If I can hide this from Maria, I may actually have a Christmas gift for her cousin...shhh! I've been one busy Christmas elf, but Maria claims a lot of the things I make! And I wonder how economical and clever it is to neglect all chores, errands, and responsibilities for the sake of homemade gifts. Let's not get mired in these technical burdens. Last night I made mice! Those mice have been an idea scurrying around in my head for several weeks... turning the wheels of my mind! I made one. Loved it. Fed it to Chango. He loved it and that was all the encouragement I needed! I hope to be shipping Christmas mice to all the cool cats on my list! I also have face cloths, scarves, hats, drawstring bags and coasters in my warehouse of homemade goodness, and if I keep reading "Sew, Mama Sew!" I will never run out of ideas I want to try. I am also impatient with and intimidated by patterns. I still keep buying them, though. What a great little wrap to put markers in! It would work for traveling. I am thinking of colored pencils. Also, I too am impatient with patterns. A couple of years ago I made some templates out of paper bags. Only my favorite patterns, pants, leggings, a sleevless top and jammies. I use them over and over again. When cutting the fabric I keep them in place by putting cans of food around the edges. I hate pinning pins! I love the marker bag, and envy your time spent sewing. Hoping that come winter, I'll have a little time to do some as well. I can't imagine having orderly arts/crafts/crayons/paints. I sort of laughed when I saw your markers. Don't get me wrong...I am in awe and a bit jealous. My kids are so disorganized and we end up with stuff everywhere. That comes from my wife's side...all crazy traits do! Anyhow, cool idea on the "new" crayons also! I love the fairy material! Very cute and wonderfully practical! I need a few of those! The marker roll is wonderful! I'm impressed that you have the patience to figure it out yourself; THAT'S the part that gives me the headache and makes me want to find someone else's pattern to take the hard work out of it for me.... Utterly impressed by your holiday workshop doings! 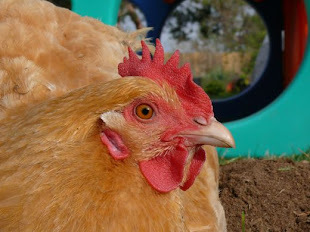 Hi...again strolling through your Blog...I love your chicken shoots...they are beautiful...congrats!